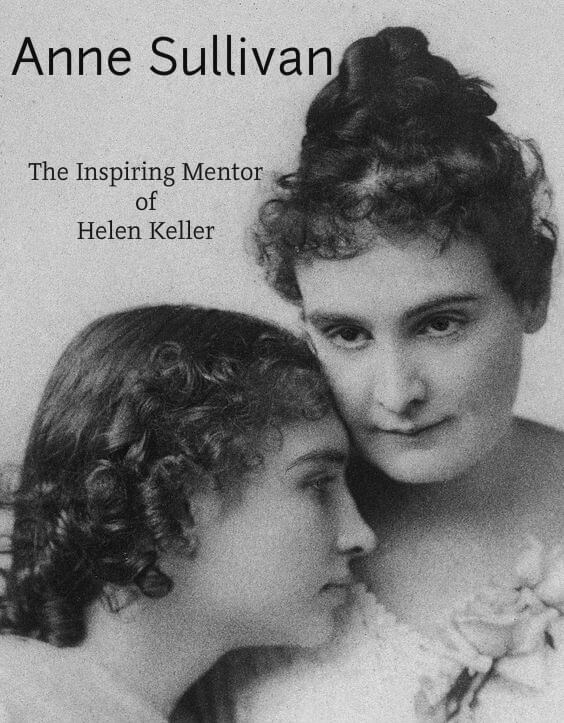 Anne Sullivan’s contribution in the life of Helen Keller is immense and fathomless. In the autobiography of Helen “The Story of My Life” she reveals how Miss Sullivan has been the inspiration behind her otherwise dull and unprogressive life. Miss Sullivan herself was partially blind and had undergone surgery to regain vision at an early age. She was educated at the Perkins Institute for Blind which later played a significant role in transforming Helen Keller’s life. 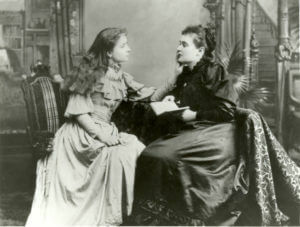 Photo of Anne Bancroft as Annie Sullivan and Patty Duke as Helen Keller in the broadway play The Miracle Worker. 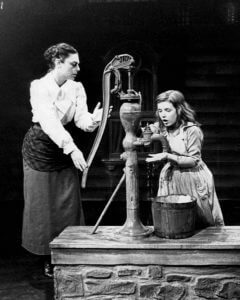 In this scene, Miss Sullivan tries to teach Helen the meaning of “water”. Helen recognizes her teacher Miss Sullivan as her friend, philosopher and guide. In her autobiography she recalls the day when she met her for the first time as “the most important day I remembered in my life”. It is interesting to note how Annie utilized every opportunity to motivate Helen and enable her to enrich herself both with knowledge and experience. Helen learnt to appreciate Nature through Sullivan. As she happily records that Anne made her feel that “Birds and Flowers and I were happy Peers”. Helen started enjoying little things from her everyday life such as “every blade of grass” or “the curves and dimples of my baby sister’s hand”. Helen acknowledges Sullivan as an in-separable part of her and claims that “the footsteps of my life are in hers”. As a mentor, Miss Sullivan was unique. She provided Helen with a certain self confidence that motivated her to love and to express herself. The 49 years long relationship that the teacher and the student shared was filled with remarkable experiences that helped in the evolution of Miss Sullivan from a Teacher and Governess to a lifelong constant companion. In various triumphs and disasters, Sullivan acted as an anchor to Helen’s life. Her patience and perseverance channelized Helen to achieve great success in life. The best reference made by Helen was when she imagined herself coming out of Egypt and standing before Sinai when “a power divine” touched her spirit and “gave it sight” so that she could see many wonders and as if she could hear a voice crying out of the sacred mountains – “Knowledge is Love and life and Vision”. 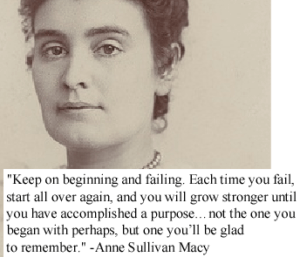 Anne Sullivan is remembered not just because of the actions she performed, but also for the words she said and wrote. Her philosophy was essentially about surviving despite the worst of obstacles. Her words, as much as her actions are motivational powerhouses of positivity. Sometimes Sullivan showed her exasperation at the education system and the society at large.